Jason Voorhees is yet another classic movie monster with a tragic beginning. After he was mocked and bullied and eventually driven to his death by the cruel kids of Camp Crystal Lake, it’s almost hard to blame him for rising from the grave to take revenge with a machete. Granted, that’s maybe an extreme reaction, but you can’t help thinking that everything would have been different if people just took the effort to treat each other with kindness and respect. Let Jason be a lesson to us all: be nice to others now and perhaps they won’t come after you in a violent vendetta later. 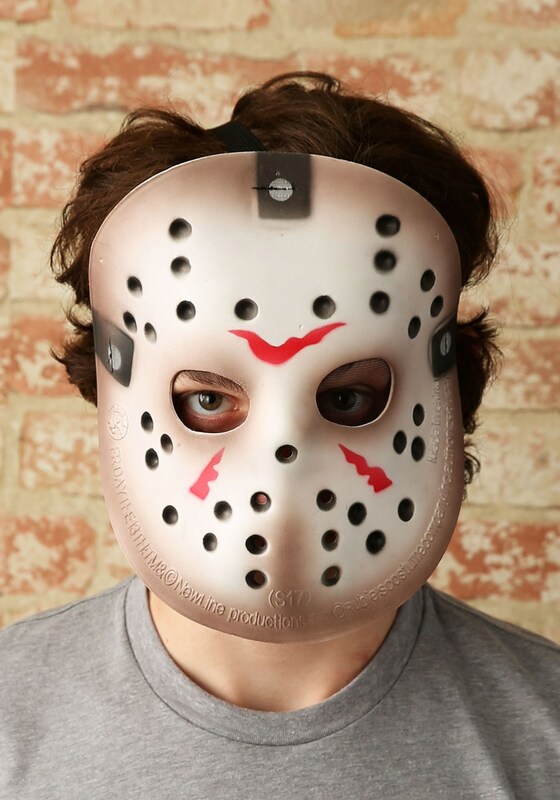 Even as a vicious undead killer, Jason was still so self-conscious that he felt the need to hide his face behind the hockey mask that became his signature piece of apparel. Show your sympathy for Mr. Voorhees in this officially licensed Jason mask, crafted with white polyfoam and marked with brown and red accents showing the scars of his many battles. It’s sure to put a scare into any costume party. On the other hand, perhaps you could wear it while doing good deeds around the neighborhood. Is it too late to redeem Jason’s murderous image and turn the other cheek? Probably, but everything is worth a shot. I actually picked this up at the Spirit Halloween store in the Galleria Mall in my town. I paid $8.00 for it but they have a cheaper mask here, maybe next time I'll get it from here. Really good mask, fits anyone's head size. Recommended in moon light and/or low light settings. Quality is good too.